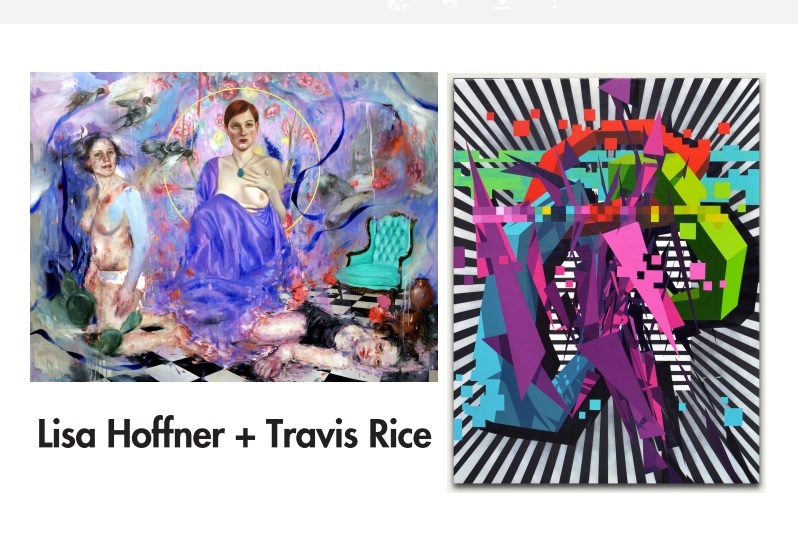 Modified Arts is proud to present the work of current ASU MFA candidates, Lisa Von Hoffner and Travis Rice. Fresh off their resepective MFA thesis exhibitions, the two artist’s works blend seamlessly in eye-catching attitude, while offering extremely distinct imagery and subject matter, forcing the viewer to grapple with rational and emotive artistic responses. Rice’s works, conversely, place geometry front-and-center. While referencing art historical forms—Gene Davis, Franz Kline, and Sol Lewitt are among his influences—the artist places the works into a thoroughly contemporary structure. It is geometric abstraction as interpreted through a literally digital lens, melding handmade imperfections with digital impossibilities. Digital models produce drawn and painted works which produce a striking duality in the artist’s technique, and the viewer’s relationship with digital and analog artforms. Together, Rice and Von Hoffner’s subjects may differ wildly, but their composition of classical and contemporary forms allow them to blend more seamlessly—each requiring the viewer to sit with the works and examine the lines each artist draws between forms.